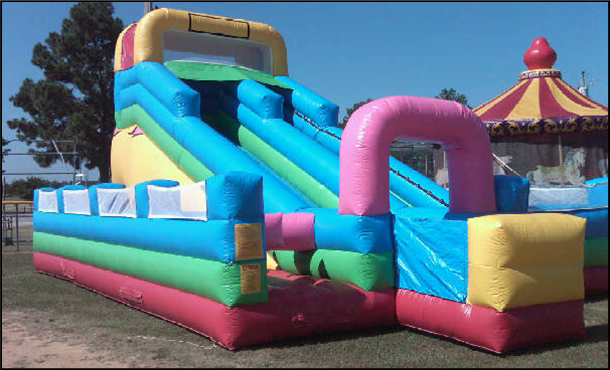 The Xtreme Obstacle Course is a great option for the kids when you’re looking for something more than a jumping castle. This inflatable obstacle course has everything you need, from tackling bags, inflatable arch obstacles to a jumping castle, rock climbing wall and two slide lanes. Experience the twisting turns of this exciting inflatable rollercoaster! This unit features eye-catching digital graphics, tackle dummies, squeeze plays, climbing walls, and slides. Two opponents compete by racing through 85' of obstacle walls, squeeze plays, tunnel crawls and more. Concluding the obstacle is a wall climb followed by a giant slide and a run through the legs of the IRONMAN. Race your opponent through this amazing camo themed obstacle course. Toxic Radical Inflatable Obstacle Course is our newest inflatable obstacle course for 2018. Two participants enter into the Toxic Radical Inflatable Obstacle Course and race through inflatable obstacles, up the climbing wall and down the slide to see who can exit first. The unit is thirty feet long and sixteen feet wide. Since it is U shaped, participants run over sixty feet to make it out. Crash Course is fast and exciting for both kids and adults! A series of obstacles await you just around every corner. Two opponents race in opposite directions through numerous obstacles to make it to the finish line first!